It's 06:40 and time to get up. Breakfast and a few stretches later at 08:00 we set off from here. 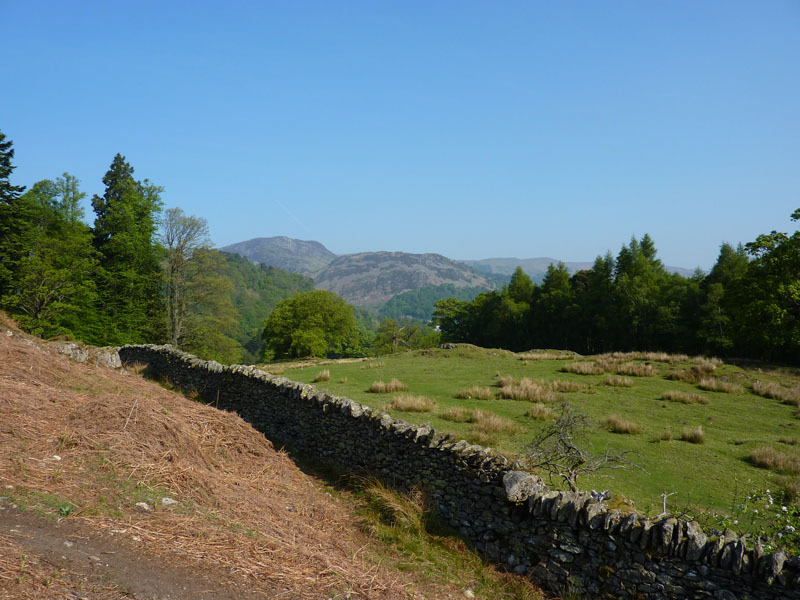 Birkhouse Moor is brightly lit by the early morning sunshine. 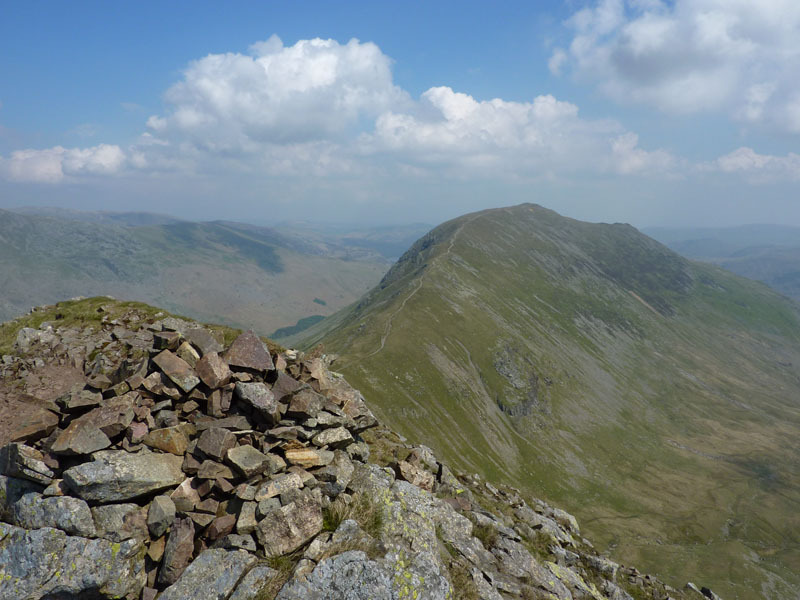 My plan was to climb St.Sunday Crag as a priority, it must be more than 20 years since I was last up there and that's far too long. 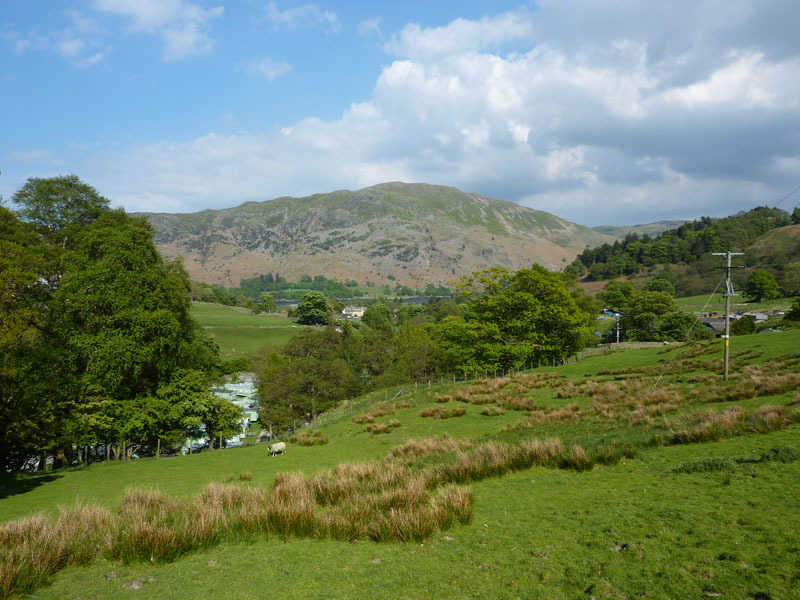 We head for Patterdale along the main road. Nice Pub! 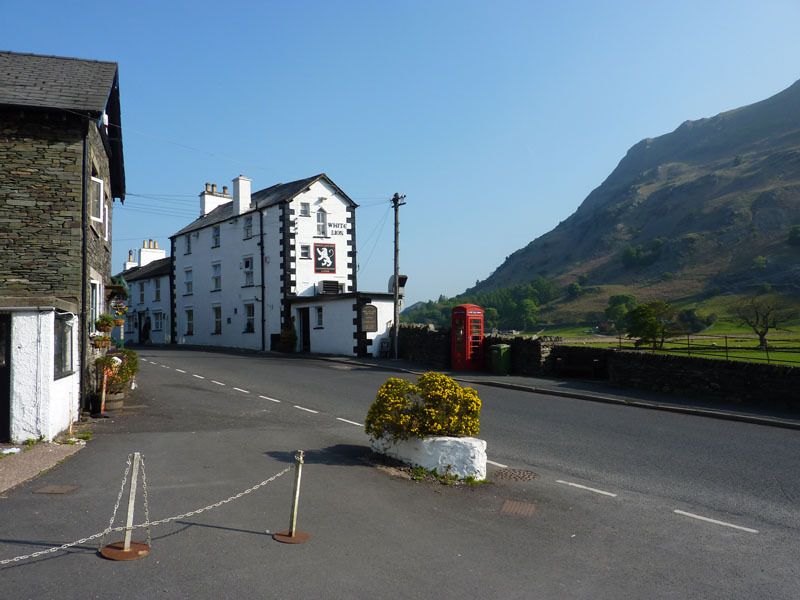 We had a couple of drinks here the evening before and met some people who were doing a Coast-to-Coast walk. 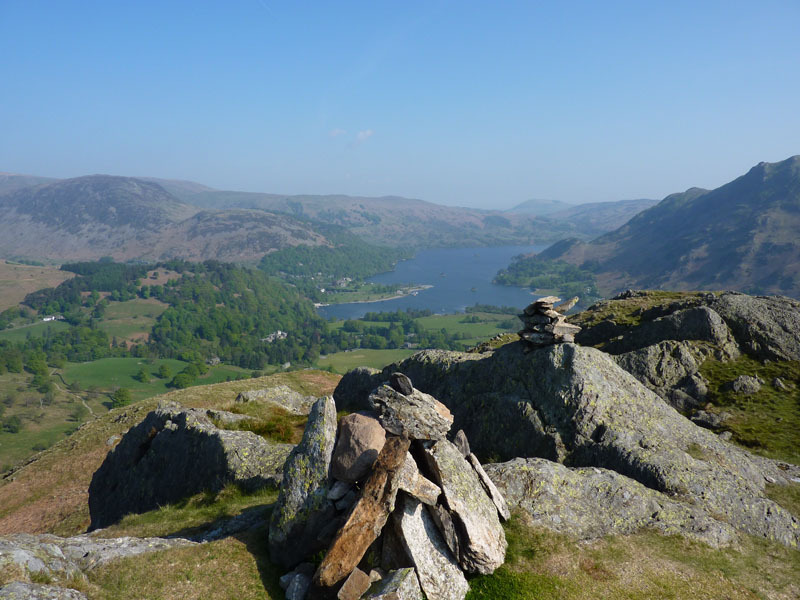 At the start of the ascent of Arnison Crag, we take a look across to Glenridding Dodd. It's rather warm. 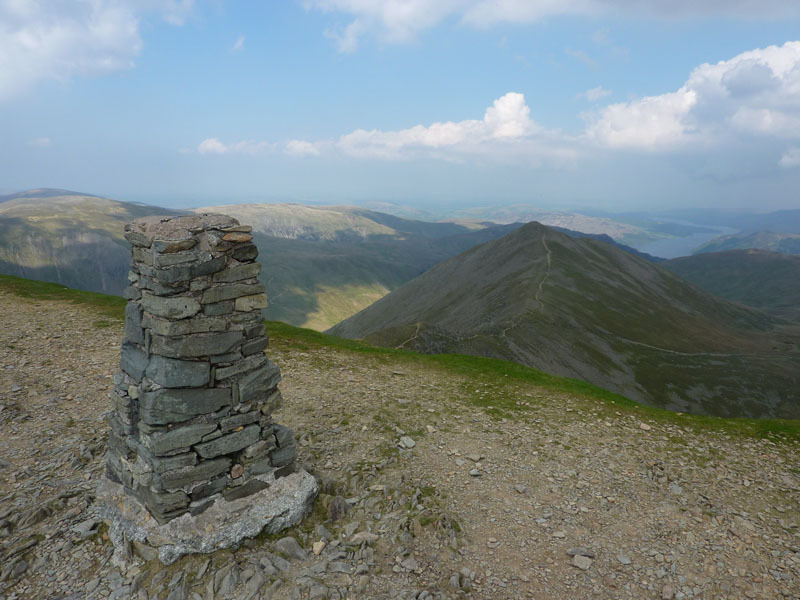 Ullswater is clearly seen from this summit at 1424 ft asl. 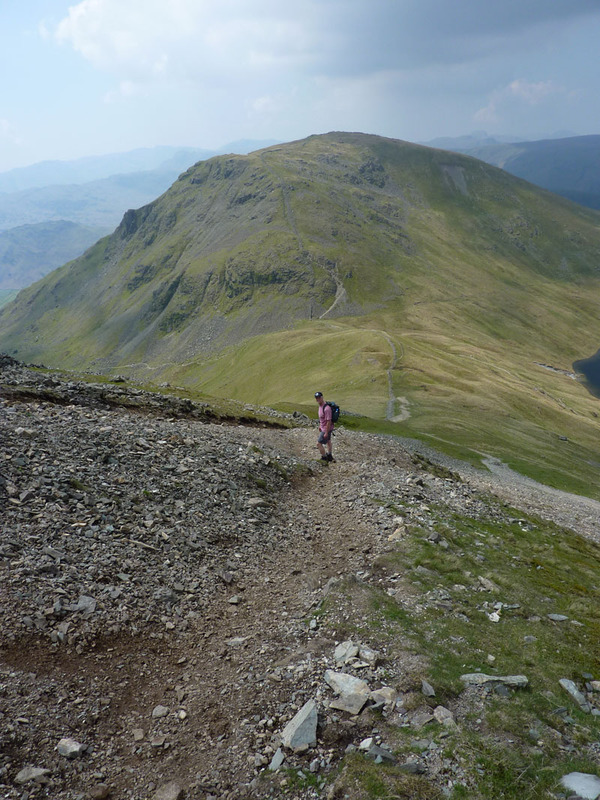 This route will lead to Birks and St.Sunday Crag, there is a more direct way, but this seemed more interesting. 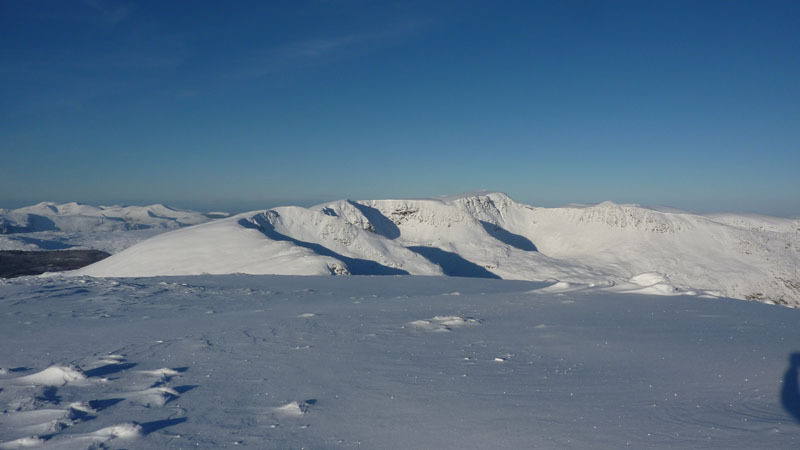 Keldas on the right, leading to Birkhouse Moor. 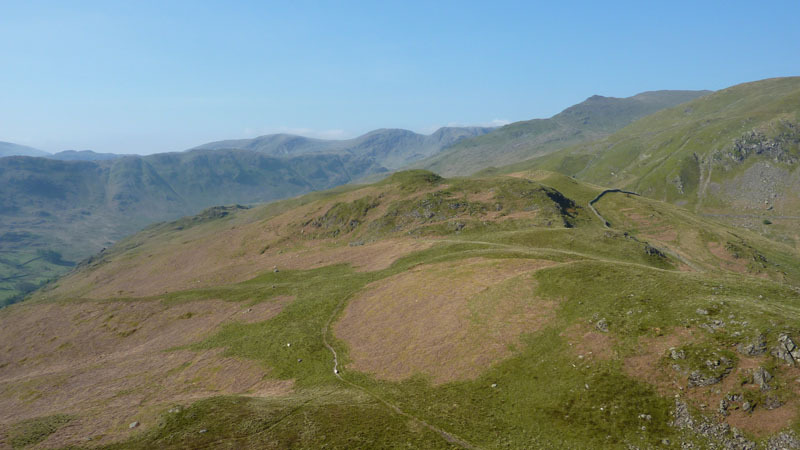 Sheffield Pike further away, centre right; Catstycam peeps over the hills - top left. 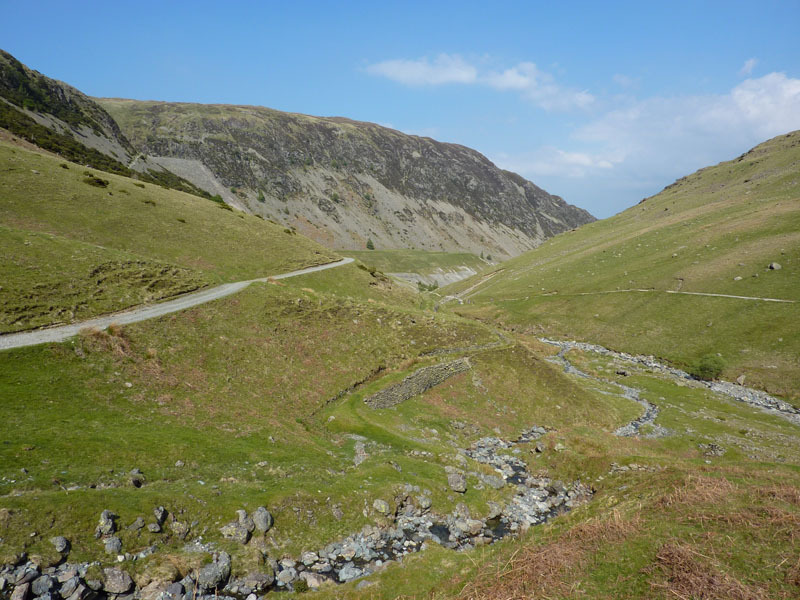 A sheep is on the footpath to Birks, it leads to Trough Head - a watershed and the top of Hag Beck. 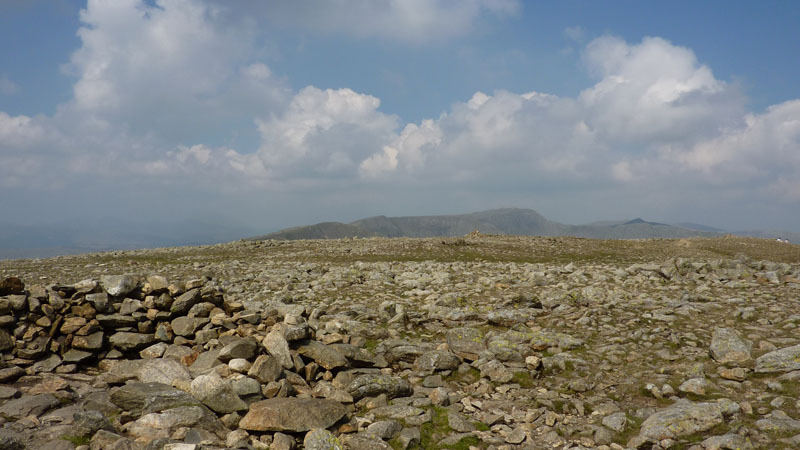 Then it's up the wall to the summit of Birks, summit No.2 for the day. 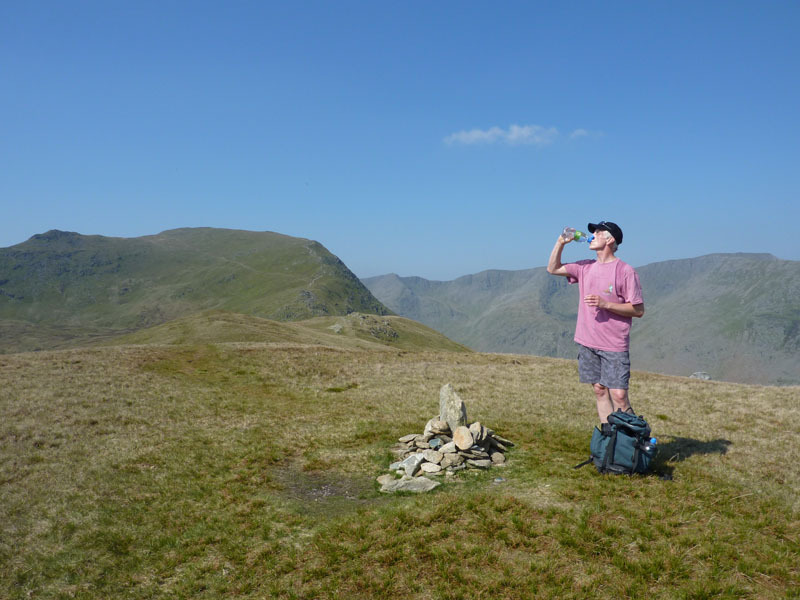 Mindful of the need for hydration, Simon carried three litres of water and the writer took nearly two - would it be enough? 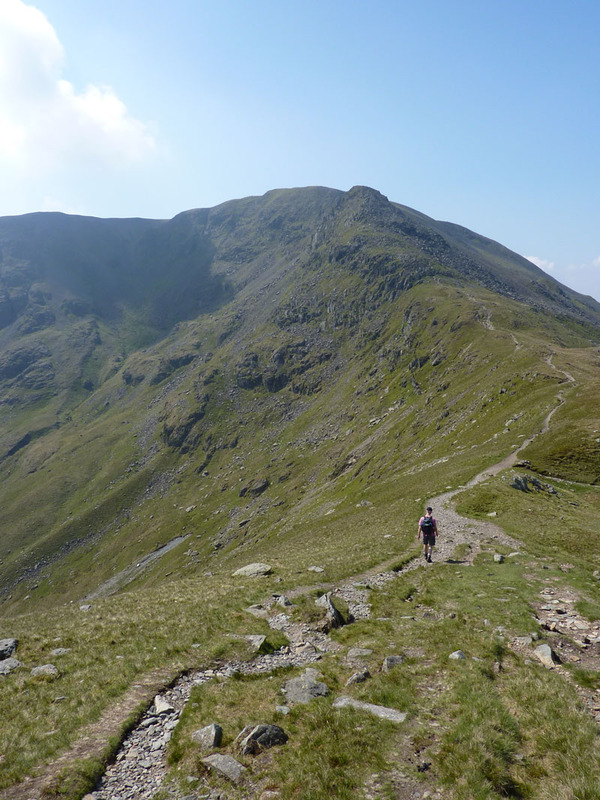 St.Sunday Crag is further away and you can see a route to Gavel Pike (on the left). 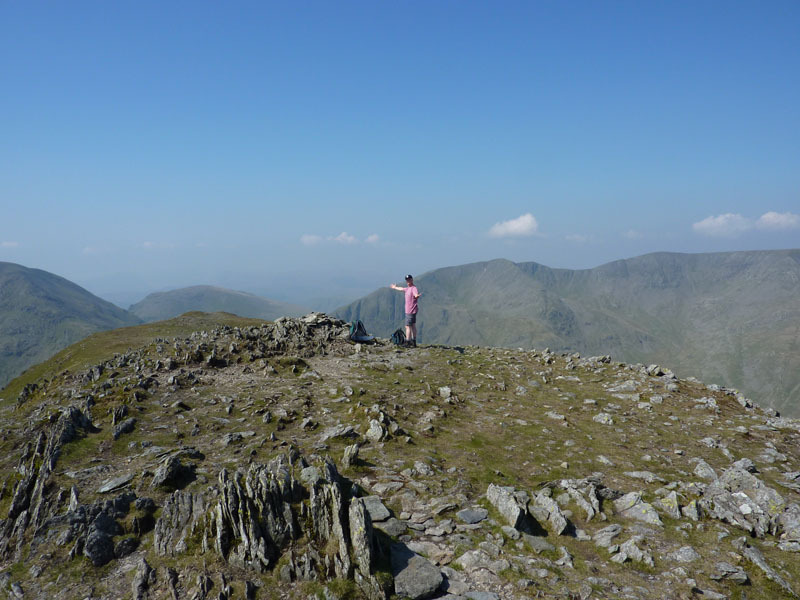 Viewers need to understand that Simon doesn't reach these mighty fells very often and so gets a little excited at times. 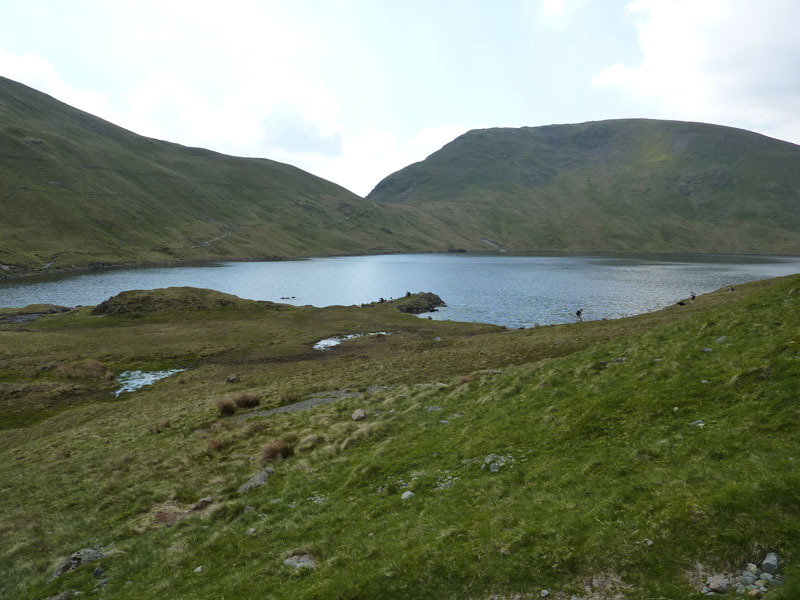 Grisedale Tarn is in view. 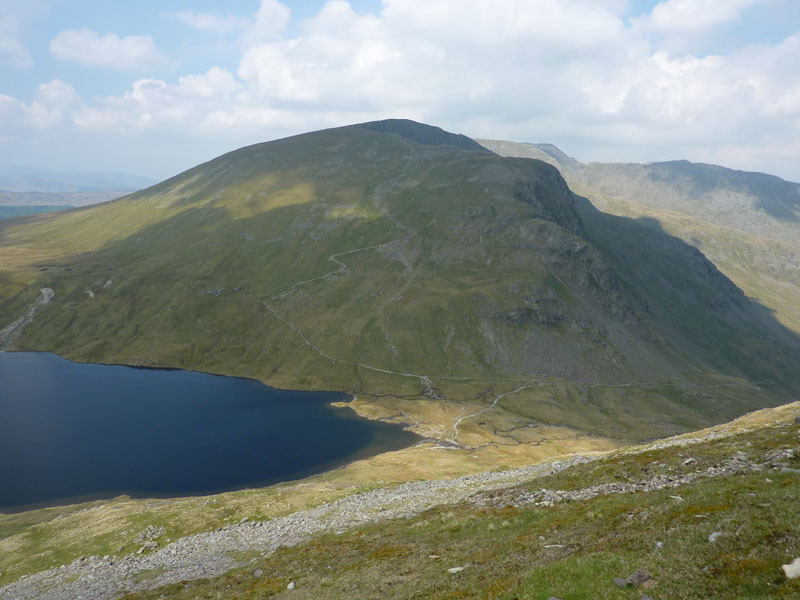 It is our current intention to descend from Fairfield to Grisedale Tarn and then ascend Dollywaggon Pike, up the zig-zags. That's about 1,100 ft of down, followed by just over 1,000ft of up. 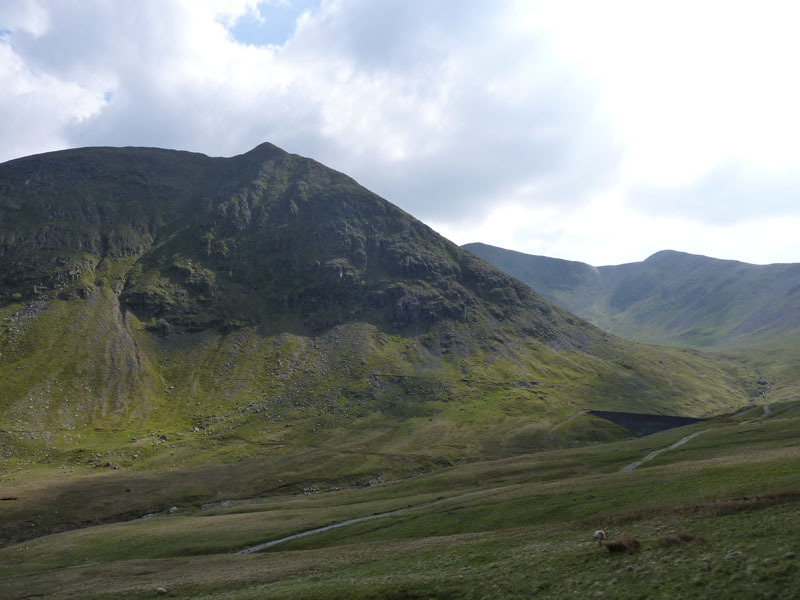 A fine mountain with a great name, where did they get that from? 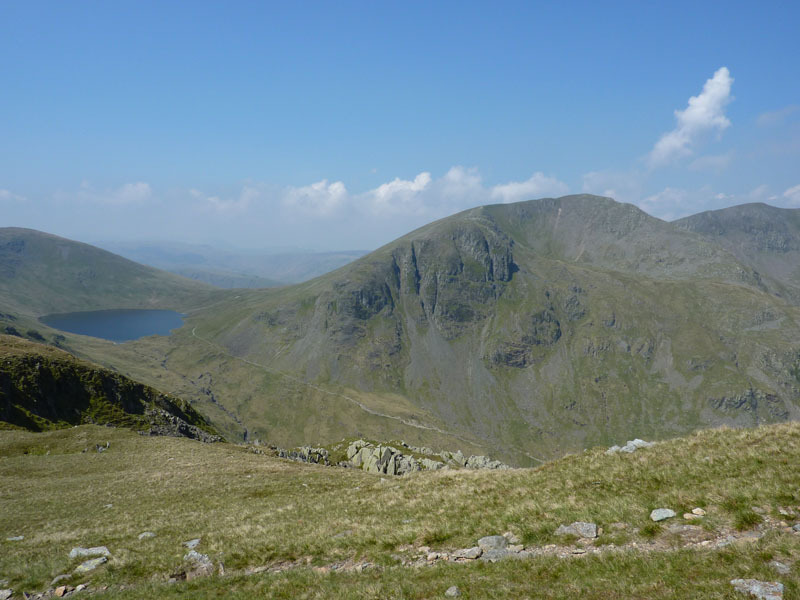 Cofa Pike is a prominence on the way to Fairfield and well worth ascending en route. Steep! Going up here is tough, going down is dangerous, be warned. 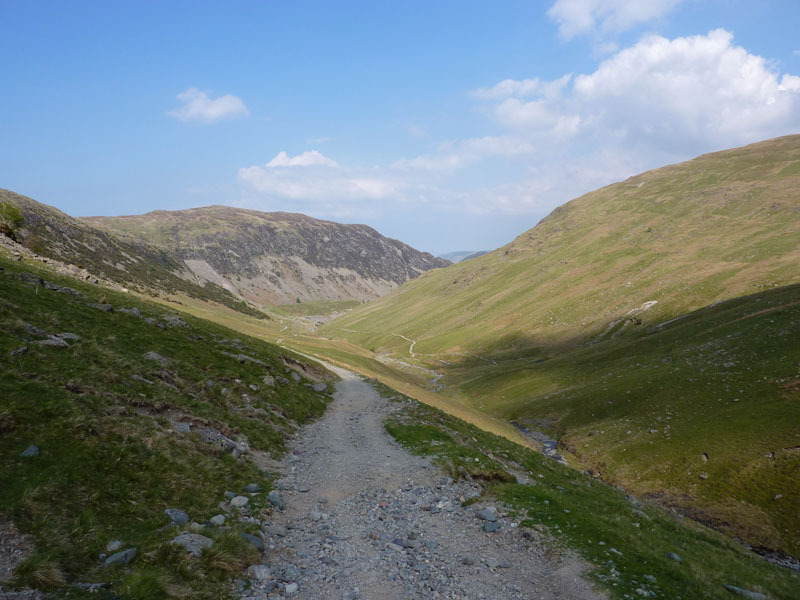 The path is a mess and widening, maybe the fell-fixers will do some work here in the future. 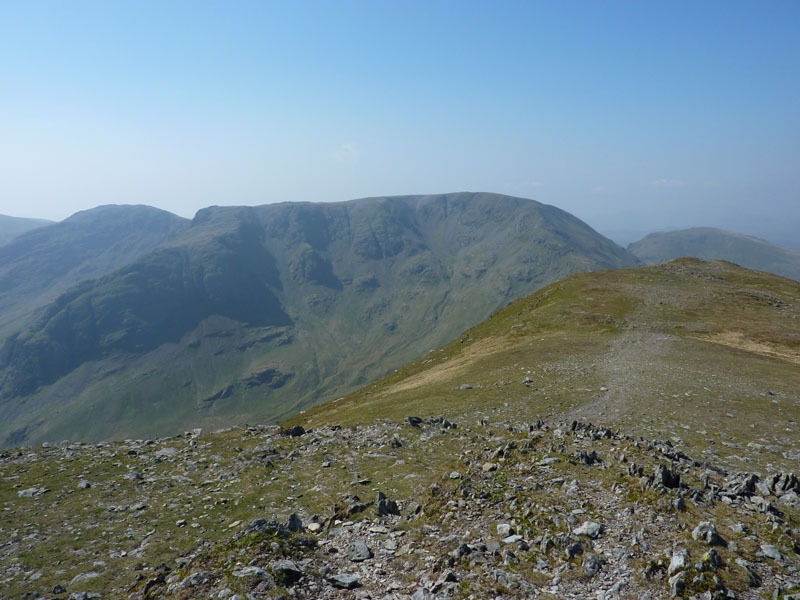 Now for the toughest ascent of the day, not because of what it is, but because it's mighty hot, we've already climbed Arnison Crag, Birks then St.Sunday Crag and Fairfield. 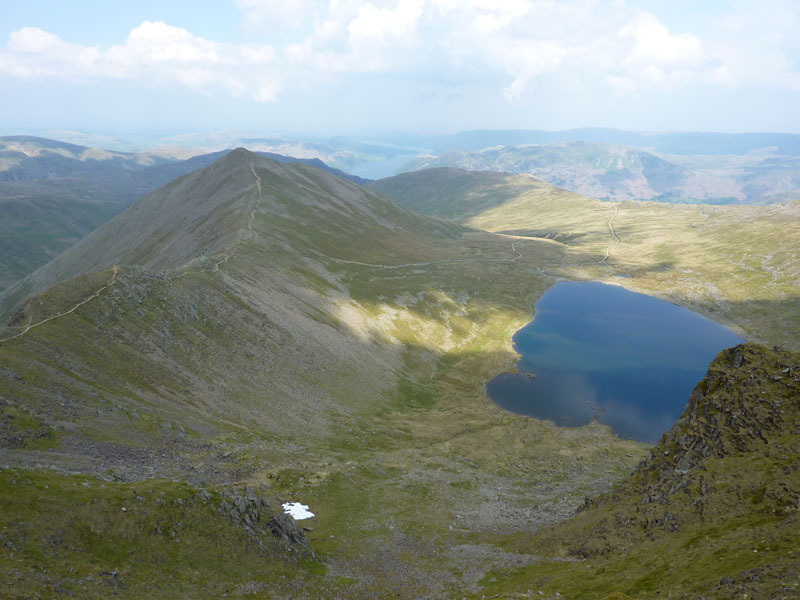 I had to sit down at one point and take a break, so I got the Wainwright out to see what he said.."The zig-zags above the tarn are tedious and often thronged with recumbent pedestrians." Quite. 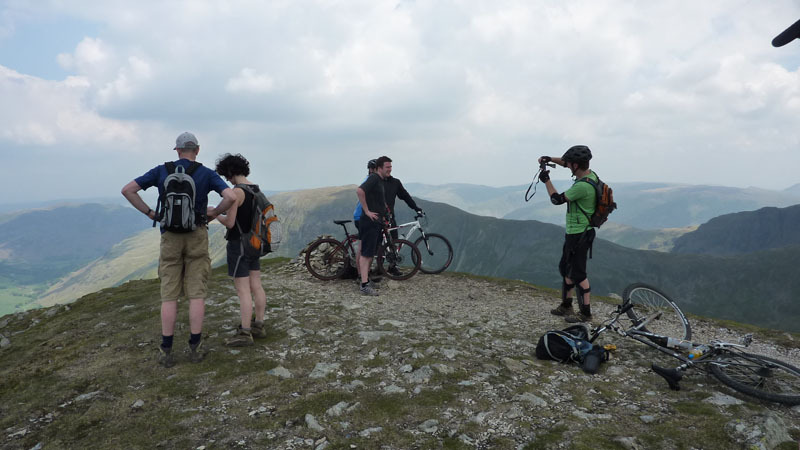 Cyclists on the fells, discuss. 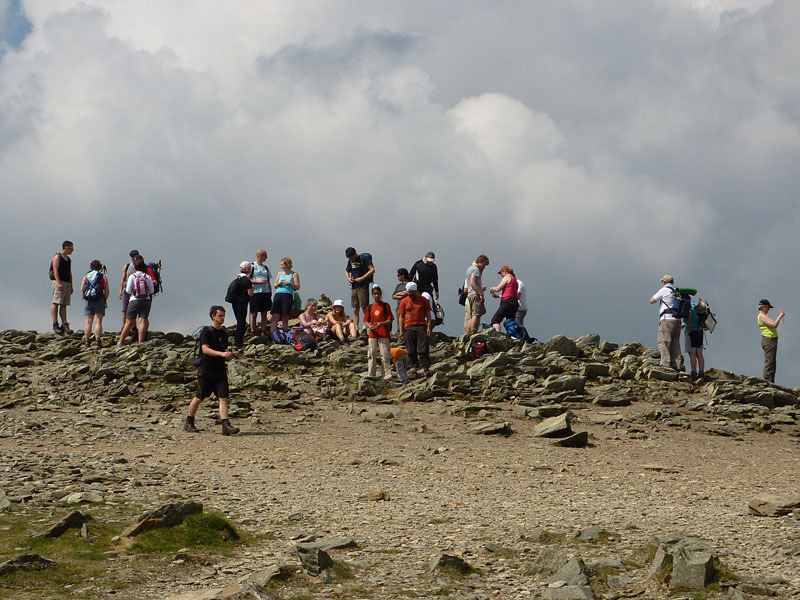 Crowds on the fells, discuss. Giddy rabble, this is why I prefer to get up to places like this early in the morning. One of my favourite mountain views and that is a little bit of snow down there. 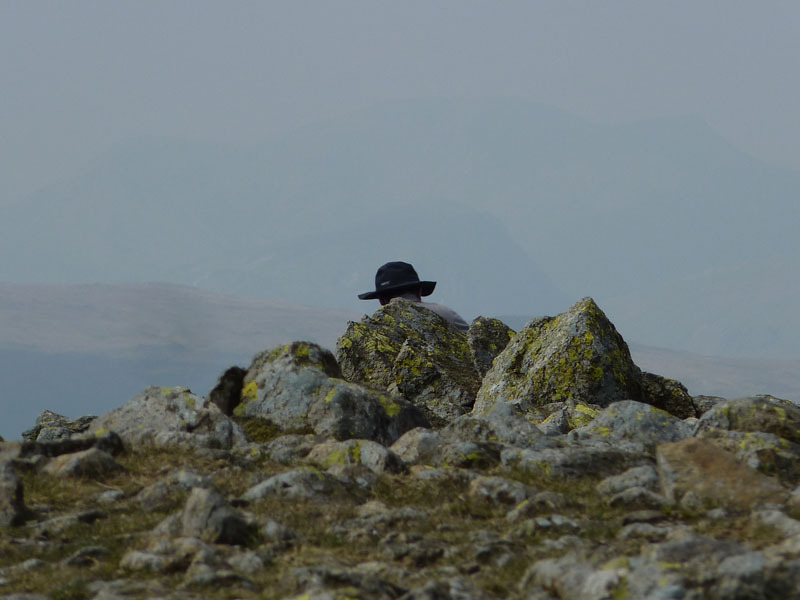 After hours on the fells, we can see our route down. 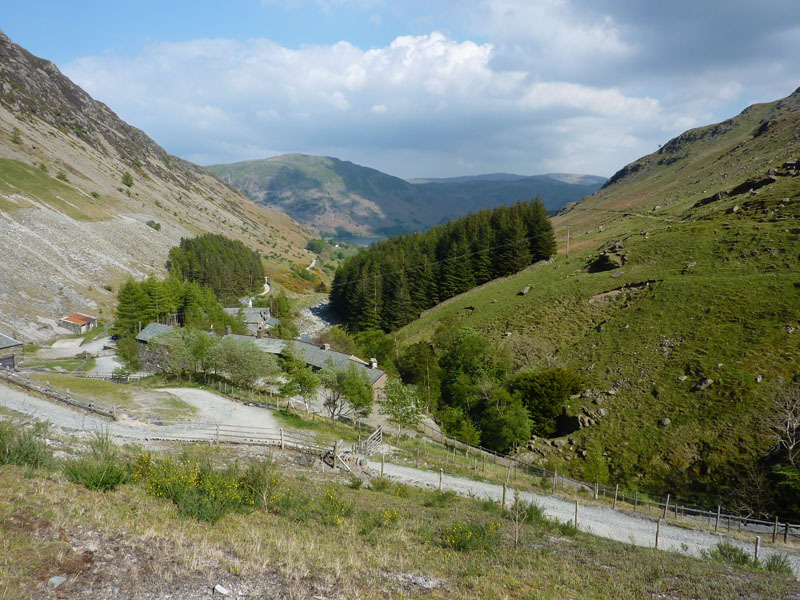 We won't go as far as Raise and take the old pony route down to Glenridding Beck. 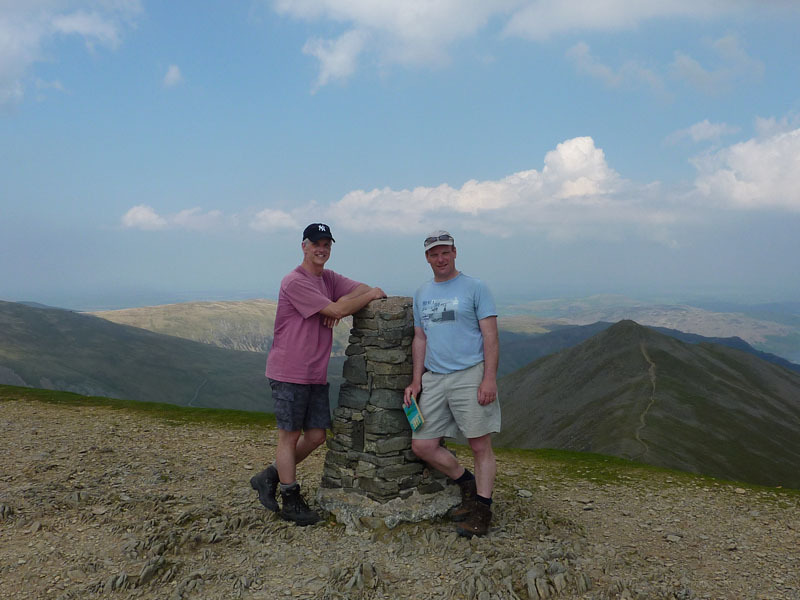 This was always the plan and although it's been very warm, we stuck to the task, eight summits. Almost back and I had a little bet (before we got started) with Simon that we could not get back to the campsite by 17:00 - as the route was too tough and weather too hot to do the walk in under nine hours. 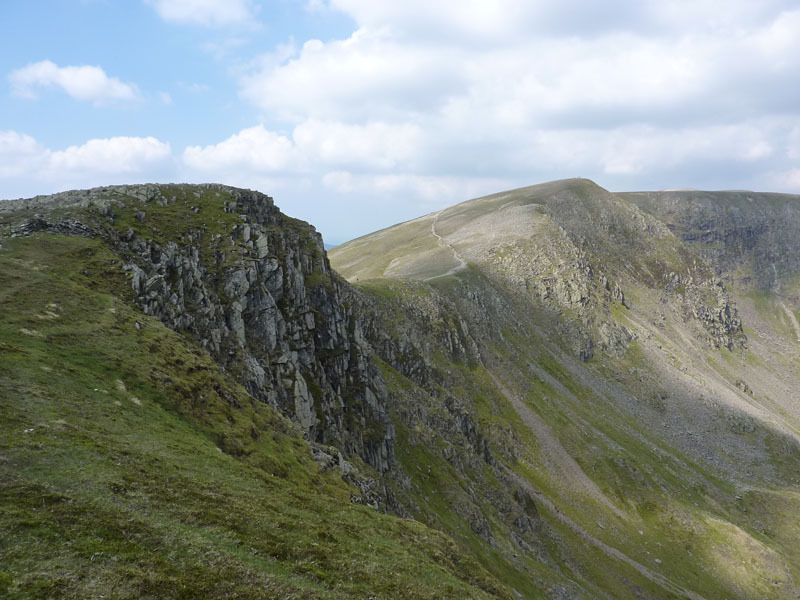 Another view of Birkhouse Moor and the time is 16:50, ten minutes inside nine hours. 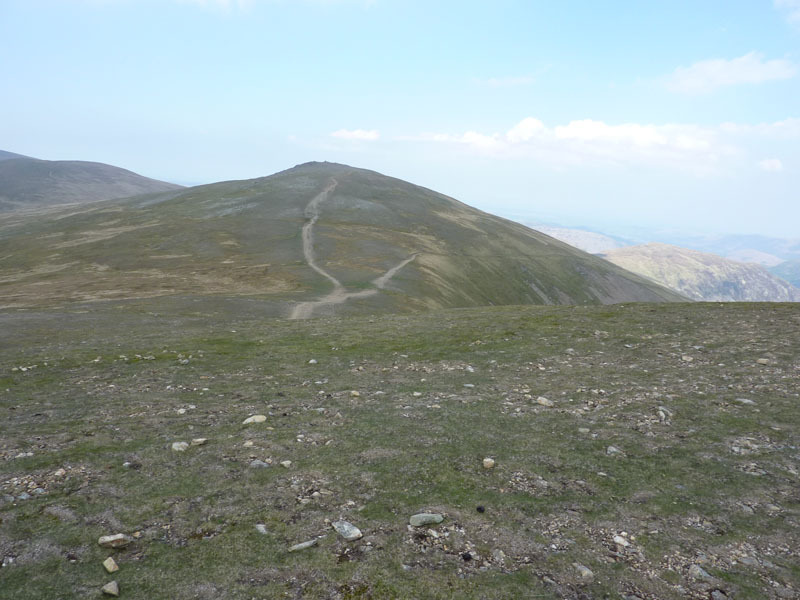 A nice round trip from the tent with 5,300 ft of ascent and about the same amount of descent. Walkers: Simon Baldwin and Me. Time taken: 8hrs 50 mins over a distance of about 14 miles. 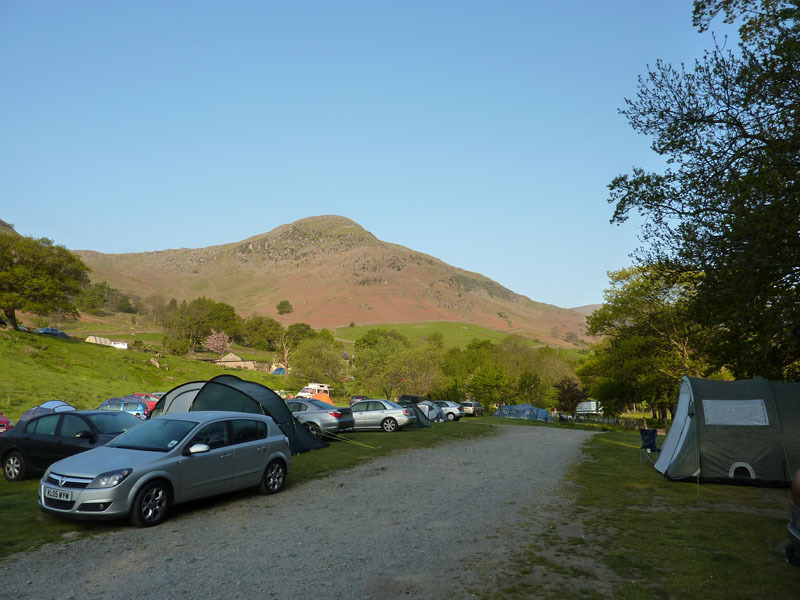 Route: Gillside campsite, the road to Patterdale, Arnison Crag, Birks, St.Sunday Crag, Cofa Pike, Fairfield, Grisedale Tarn, Dollywaggon Pike, Nethermost Pike, Helvellyn, Lower Man, White Side, old pony track down to Glenridding Beck, Gillside campsite. 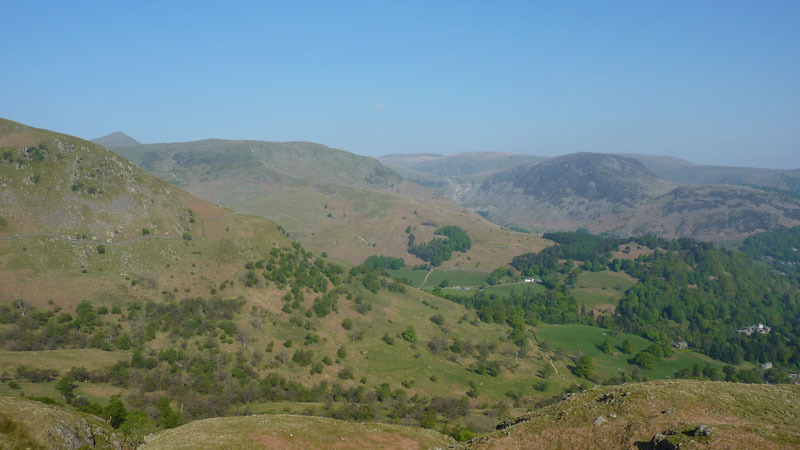 Weather and conditions: Hot and Sunny. 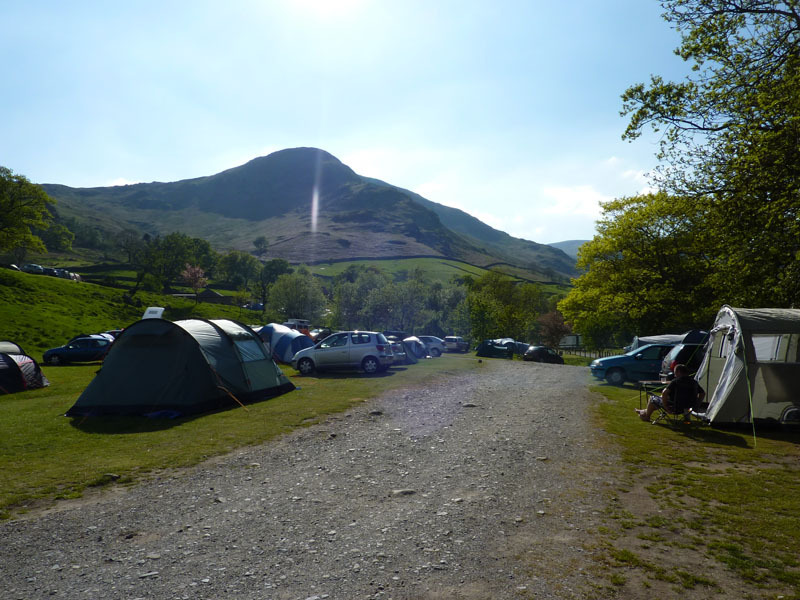 Greetings Count: One man on St.Sunday, reasonable numbers on Fairfield, masses on the route to Helvellyn. Cylists may aswell be from another race for the degree of respect they show fellwalkers. Richard's Refreshment Review: We retired to the Travellers' Rest for a meal and drinks. Some good choices on the menu including home cooked steak pie. 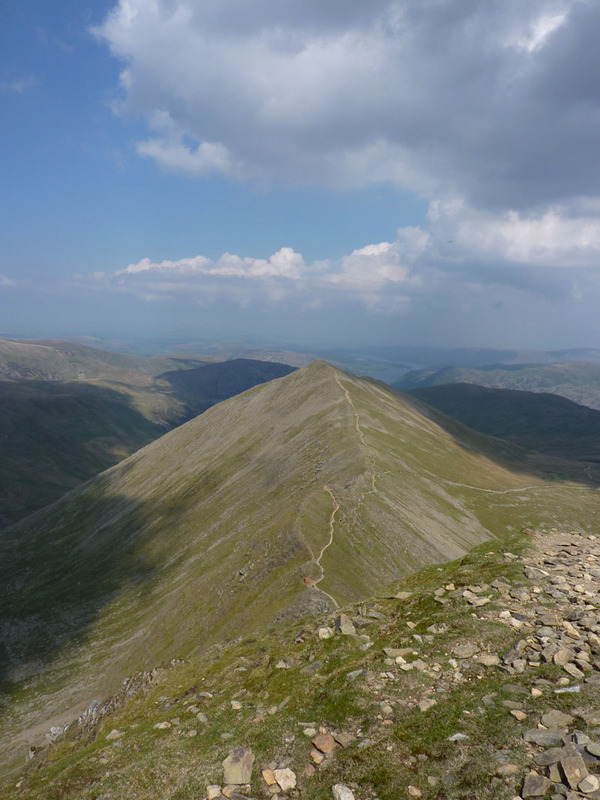 That's the third time I've been on top of Fairfield in the last 12 months - three different days and ascent routes. We finished with no water left in the bottles. 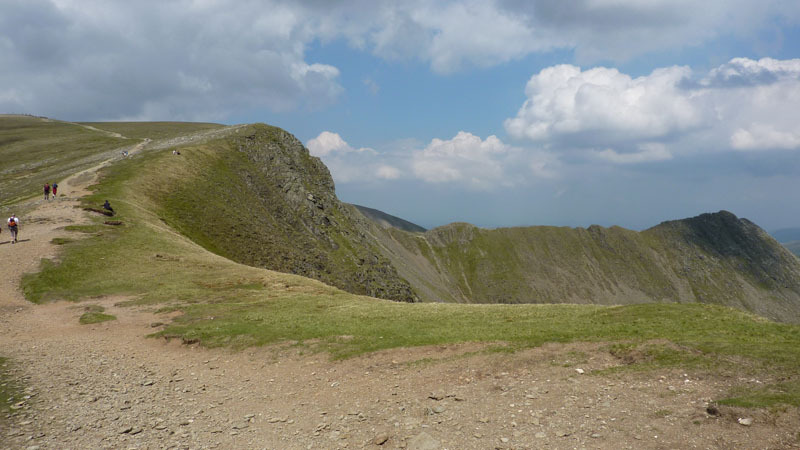 Helvellyn remains a favourite, it's a great mountain, best seen early in the day. 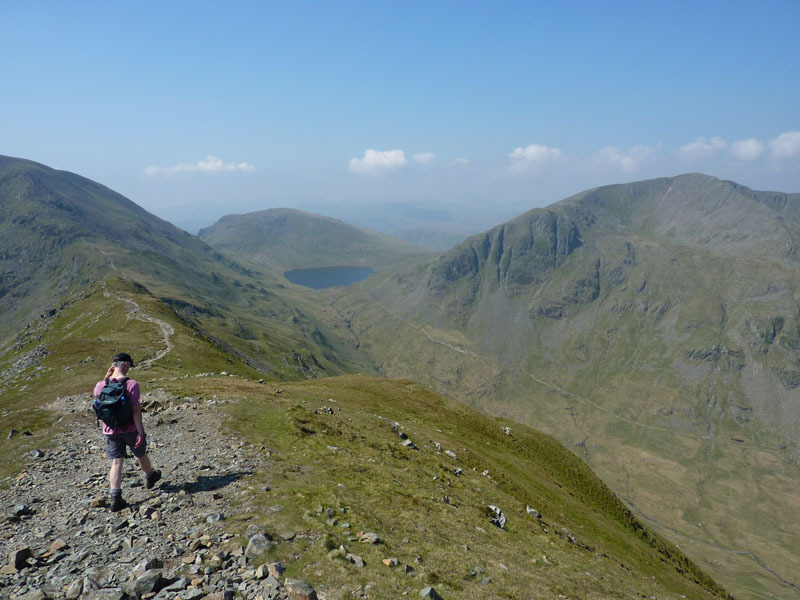 * During a review of 2010, I decided that this was "The Walk of The Year" - it's what I bought my boots for!